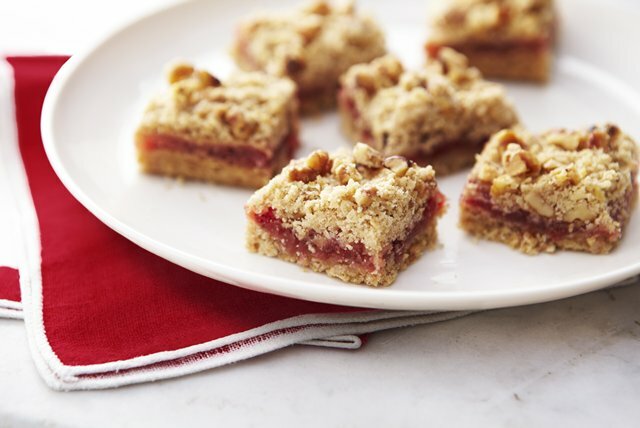 Use our recipe for super-easy freezer jam in these delectable oat squares. Mix oats, flour, sugar and baking powder in large bowl. Cut in butter with pastry blender or 2 knives until mixture resembles coarse crumbs. Press 3 cups oat mixture firmly onto bottom of 9-inch square baking pan. Spread jam over crust. Mix nuts with remaining crumb mixture; sprinkle over jam. Bake 30 min. or until topping is lightly browned. Cool completely on wire rack. Substitute purchased strawberry jam for the freezer jam.